TOM CRUISE as Stacee Jaxx in ROCK OF AGES. 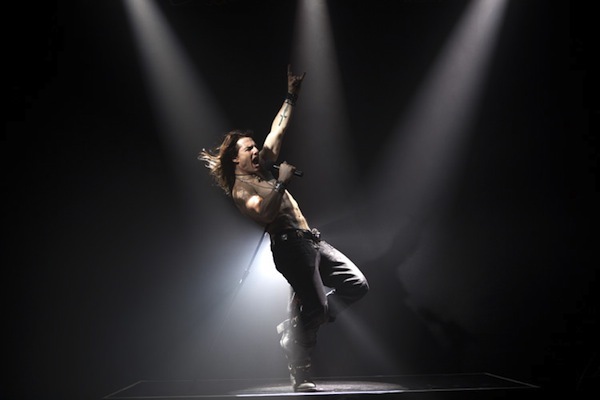 New Line Cinema’s ROCK of AGES is hitting theaters this Friday, June 15th! The film features Mexican born actor/singer Diego Boneta, Julianne Hough, and an all-star cast that includes: Tom Cruise, Russell Brand, Paul Giamatti, Catherine Zeta-Jones, Malin Akerman, Mary J. Blige, and Alec Baldwin. This musically dynamic film is about a small town girl Sherrie and a city boy, Drew, who meet on the Sunset Strip while pursuing their Hollywood dreams. Their rock N roll romance is told through the heart-pounding hits of Def Leppard, Joan Jett, Journey, Foreigner, Bon Jovi, Night Ranger, REO Speedwagon, Pat Benatar, Twisted Sister, Poison, Whitesnake, and more! This is definitely not your average musical! Check out the Movieclips PopUp Trailer for Rock of Ages and more photos below!